Heat the oven to 400 degrees Fahrenheit. 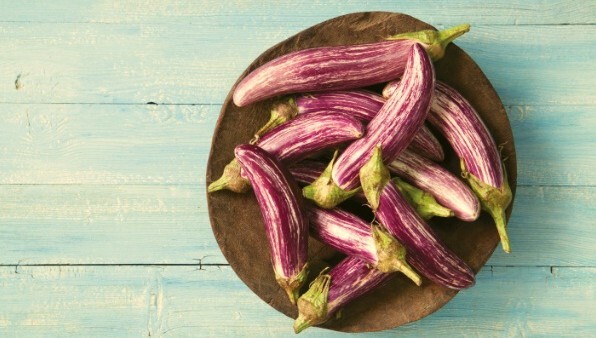 Line a large rimmed baking sheet with foil and arrange the eggplant slices in a single layer. Sprinkle lightly with salt and spray with olive oil. Turn the slices over, and repeat. Roast for 15 minutes, turn with tongs, and roast for a further 10 minutes, until the eggplant is soft and browned. When cool enough to handle, quarter each slice, and set aside. Heat the olive oil in a large skillet over medium-low heat. Add the onion and sauté until softened, about 3 minutes. Add the fennel and sauté for another 3 minutes. Stir in the tomatoes, olives, capers, currants, pine nuts, a grinding of black pepper (no salt at this point), sugar, and vinegar, and cook until slightly thickened, about 15 minutes. Stir the eggplant into thickened tomato mixture. Taste for seasoning, and adjust as needed. Let cool, cover and refrigerate. Serve the caponata at room temperature with Walnut Bread, or plain gluten-free crackers. Cooking time: about 50 minutes.